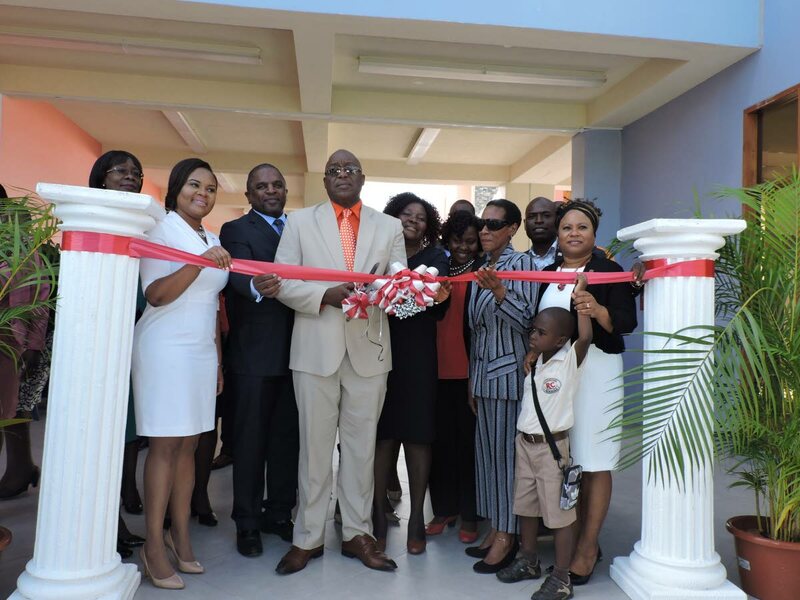 THA Chief Secretary and Secretary of Education, Innovation and Energy Kelvin Charles cuts the ribbon officially commissioning of the Scarborough Roman Catholic School at Smithfield on August 29. Also in photo,from left, are Health Secretary Agatha Carrington, Sports Minister and MP for Tobago West - Shamfa Cudjoe, Finance Secretary Joel Jack, Ag Principal Patricia Wafe, Catholic Education Board of Management representative Agnes Murray and Presiding Officer of the THA Legislature, Denise Tsoiafatt-Angus. The Division of Education is investigating reports that “a few students and one teacher have slipped and fallen on the tiles” at the newly built Scarborough Roman Catholic School at at Smithfield Road in Scarborough. The school was commissioned on August 29 in time for the opening of the new school term on September. At that event, in an address had said that the journey of excellence of the school was now positioned into a new environment with a high degree of comfort, safety and ambience. He said the school was OSHA compliant and easily accessible for the differently abled and was the first of its kind in TT boasting three storeys with 27 classrooms to accommodate 750 students, a staff room, a computer room, a cafeteria, sick bay, a library, a chapel and an elevator. On August 8, at a post Executive Council media briefing at the Administrative Complex in Calder Hall, Charles said the school was completed within the allocated time and budget. Construction, he said was supposed to have taken place within a planned time frame of 18 months with the THA expending $83 million from an original budget of $85 million. On the second day of the new school term, officials of the school reported flooding in a classroom and along the corridor, from rainfall. Charles had said the Division was unable to uncover the cause of the problem because no one was around when the flooding began, after heavy rainfall the previous night. He had said that heavy winds might have blown water into that side of the school. Orlando Kerr, Tobago Officer of the Trinidad and Tobago Unified Teachers Association (TTUTA), has contended that the flooding at the school was caused by poor construction. Reply to "Students, teacher fall on slippery tiles"